If you want to engage in currency trading, you need to have the right currency trading training. On this site you will find the Currency Trading Education, info on the best currency training courses, the best free training, strategies and tools, to help you become a successful FX trader from home. 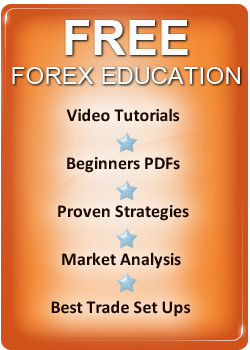 If you are paying for products, we review all the best from software to books so if you get it for free or pay for it, you will find the best education for bigger FX profits. Like any new venture when you trade foreign exchange markets for profit you need to be prepared, by learning the right skills to succeed. It looks easy but the fact is 95% of new currency trading accounts are soon wiped out but this is normally due to poor currency trading education and training, rather than an inability to learn to trade successfully. Traders who fail tend, to have no FOREX training or get the wrong education, believe the hype promoted about what is needed to succeed and finally, most traders even with good systems fail to learn the right trading psychology. Let's start first with a few things you should NOT do when learning to trade currencies so be aware of the following myths which will see you lose. Don't try day trading methods they don't work as the time duration is to short to make money in. Don't be taken in by guru's and so called experts, who say they can give you success with no effort or say they have found some secret which will allow you to make big profits with little or no risk – it's not true. Don't ever buy one of the huge amount of currency trading robots which only come with back tested results or fake track records which are never audited. Don't fall for the idea you can see into the future and predict the movement of a currency in advance you can't. Now there are other trading mistakes but the ones above, are the most popular misconceptions new traders have about trading foreign exchange and the result of believing them is an empty trading account. The good news is if you want to learn to win and are prepared to study, you can enjoy trading success. In terms of learning to trade you have two choices, you can teach yourself or get FOREX training, from other professional currency traders via courses, seminars, webinars and individual mentoring. So which method should you choose? Self Teaching or Currency Trading Advice? The choice is really yours and down to your personal preference, some people want to teach themselves and others like to get some help so they can fast track there trading education but either way, you can learn the FOREX skills needed to succeed. There is a huge amount of free FOREX training online and you can get good info on, the basics of currency trading, the best trading strategies, technical analysis and a vast amount of research on, just about any topic you are searching. If you study, info on chart set ups and technical trading tools, you can build a simple, technical trading strategy which can make profits. While you can find a lot of written currency trading information online, you should also make sure you check out Youtube.com. The site has a huge amount of video tutorials and education, on every aspect of trading currencies successfully and many people also find it easier to learn trading while watching than reading. Finally, you will get many free seminars and webinars you can attend but most, don't teach you much at all there just a sales pitch for a vendor selling their FOREX product or guide. If you are self teaching you should also check out some classic investment books which you can find reviews of on this site which will give you an insight into the minds of the top FOREX traders of all time and how they made profits. Even if you buy a currency training course and take instruction professional, it's still up to you, to learn and digest the knowledge and apply it to achieve success. This is why you can't simply follow someone else's trading signals to success. When trading you will have to execute the trading system through periods of losing trading signals and this requires, inner confidence. At some point all traders face periods, where they lose a number of trading signals consecutively and during these periods, its vital you don't lose confidence in your trading strategy. If you lose confidence, you will lose discipline, money management will suffer and you will run losing trades and cut winners which is the opposite, of what you need to do to achieve success. When look for currency training, make sure you learn from real traders; don't believe the vast number of courses online which tell you that you can win the majority of your trades this is not the reality of FOREX trading and the vendors who sell this message are not Traders and lying. If you want more on choosing the Best Currency Trading Courses, you will find plenty of info on this site. You will want to learn knowledge which you can learn and apply and you are comfortable with you will never apply a system with discipline, when you don't know the logic its based on. FOREX trading is all about having confidence and that's why you need to make a strategy your own. FX Course material varies from course to course but you will normally get the trading strategies in written PDF form and with many training courses, you will also get video tutorials, webinars or even FOREX seminars you can attend in person. Simply research what is on offer and ask the seller of the training course, any questions before buying and most reputable vendors will be pleased to answer them. You should make sure you get full support and can ask questions when you want and many courses offer practical examples of their trading style in real time trading so you can trade alongside them. These currency trading lessons, are normally via a members centre or trading set ups which are emailed to you. Most reputable courses offer 100% money back guarantee within a set time period so make sure if you buy one this is available, just in case the system doesn't live up to your expectations. How much should you pay for a training course? This depends on the information given but you can get a good course and support for between around $100-$200 which is affordable for most traders. There are many courses which charge bigger amounts and claim, there education is advanced or they have some FOREX secret which no one else knows - don't believe them, its all marketing copy and the material will not help you get a trading edge. Currency trading and training should be based on simple principles and trading techniques. This is because its proven, that a simple trading strategy is all you need to become a successful currency trader, the rest is down to confidence and mental discipline which we discussed earlier in this article. A currency trading training course, can show you all the tools you need to succeed but it will be up to you to apply them with confidence and discipline. Anyone can learn currency trading but most, either learn the wrong information or underestimate, the mental discipline involved in achieving currency trading success. If you have understood this article, you will be able to find the FOREX education you need, to help you build a lucrative second income trading global currency markets from home.